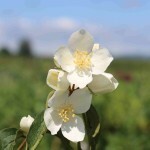 A medium sized, upright shrub that has profuse clusters of fragrant, single white blooms in the late spring to early summer. It was selected for cold hardiness and heavy bloom. It has good disease resistance. It grows best in full sun to part shade, and is tolerant of a wide range of soils. Summer watering will encourage the plant to produce more flowers.